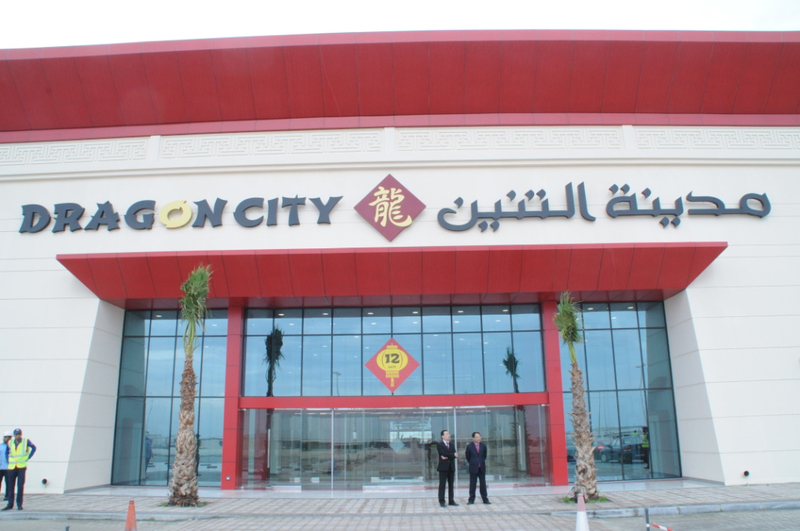 Dragon City ... spread over 115,000 sq m.
A $100-million project that has created Bahrain’s own Chinatown was inaugurated at the end of last month (December 27, 2015). Dragon City, which is described as the “only one of its kind in the region designed to encompass the superior standards it boasts, both structurally and on an infrastructural basis” has been jointly developed by Diyar Al Muharraq and Chinamex. Spread over a total land area of 115,000 sq m with a built-up area of 56,000 sq m at Diyar Al Muharraq islands on the northern shores of Muharraq, Dragon City is the first of its kind development in Bahrain. Offering wholesale and retail opportunities to local consumers, trade customers and tourists, it encompasses Dragon Mall and a themed dining village. The mall design is infused with Chinese architectural and cultural aspects incorporating over 747 commercial units for both retail and wholesale trade and additionally, a 4,500-sq-m area designated for warehouses. The dining village spans a land area of 6,000 sq m and a car park large enough to accommodate 1,500 cars. Additionally, Dragon City includes Dragon Apartments in close proximity to Dragon Mall. Occupying a total area of 20,000 sq m, Dragon Apartments comprise six multi-storey residential buildings of four and six storeys and a total of 300 apartments. These are seen to be the ideal residence for those who have invested or are working in Dragon Mall. Work on Dragon Apartments is complete and the first group of residents is due to move in their apartments soon. About 60 per cent of the shops were expected to be ready to operate on the opening day, covering building materials, lighting fixtures, furniture, electronics, home appliances, children fashion and garments, as well as a food court. He says Dragon City is a good example of joint efforts by Diyar and Chinamex, and support from both China and Bahrain’s governments. The Dragon City concept was launched in May 2012 as a result of an agreement between Diyar Al Muharraq and Chinamex. Nass Contracting was then commissioned for its construction, while Cluttons was appointed as the leasing agent for the project in Bahrain. An agreement was also signed with Bin Faqeeh Real Estate Development Company for the development of Dragon Apartments, while and Banz Group was appointed for warehouse management and logistics services for Dragon City. Diyar Al Muharraq is a masterplanned city offering a mix of residential and commercial properties. It is a comprehensive and fully integrated modern city, located off Muharraq and comprises seven islands with a total of 10 sq km of reclaimed land. Upon completion, Diyar Al Muharraq will encompass more than 40 km of waterfront with sandy beaches, and all the elements of a vibrant community ranging extensively from fully equipped educational facilities and schools, medical centres, recreation facilities, shopping malls, parklands, hotels and marinas.